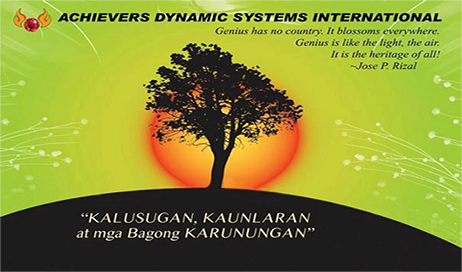 We are a non-political, non-sectarian and non-profit organization conducting FREE seminar-workshops to make known the ten (10) ADSI Techniques to empower practitioners for health, success, material prosperity, development of mind power and multiple intelligences, and to enable them to attain their goals in life. These techniques will also be of great help to those people who do not desire material wealth but their heart wants peace of mind and higher consciousness. They just want to be alive and appreciate the beauty of self and existence, to exist and behold in awe the wonders and goodness of life on earth. awe the wonder and goodness of life on earth. If you find that these techniques help you, your family, and loved ones, kindly share it with others so that the greater part of humanity may benefit from this knowledge. The 8pm-8:30pm Heart Radiation is set to Manila, Philippines time. If you live in another country, kindly check this LINK to synchronize your time with 8pm Manila Time. This simultaneous practice amplifies the effectiveness of the technique and fosters a sense of unity and oneness among practitioners all over the world. For scientific basis and verification of the 8pm-8:30pm Heart Radiation, kindly watch the following videos in this website: Mysteries of the Heart, The Heart's Intuitive Intelligence, and Science of the Heart. Dr. George W. Crile, of the Cleveland Laboratories, announced that he had discovered at the heart of every living organism a tiny nucleus of energy, all aglow, with temperatures ranging from 3000 to 6000 degrees of heat, which he called "radiogens" or "hot points" precisely akin to the radiant energy of solar matter. He affirmed, that a tiny particle of the sun's power and radiance was lodged within the heart of every organic unit. This 8pm to 8:30 pm Heart Radiation is a very powerful technique to reprogram one’s subconscious mind as an Achiever’s mindset, and be receptive to the limitless possibilities of success consciousness for prosperity and abundance; for protection of country, self, and loved-ones. For 30 minutes, every 8:00–8:30pm, sit relaxed and close your eyes. (J) — JOY: (2 minutes) Feel your heart-sun to be the embodiment of joy and bliss. Don’t merely think of joy or bliss; feel it as vividly as you can. If you feel the urge to smile, then smile. It may help you feel joy better. Feel each positive attribute as a bundle of energy emanating from your heart-sun. Let this energy radiate all over your body. (V) — VITALITY: (2 minutes) Feel strength and vitality. Your heart-sun is awash with vim and vigor. With every positive feeling you emote, visualize the light to glow more and more bright and intense. (P) — PEACE: (2 minutes) Then, feel your heart-sun to be filled with goodness and peace. Everything is alright and in perfect harmony. There is peace in your heart-sun, and you are at peace with yourself, with the world and the entire universe. (L) — LOVE: (2 minutes) Feel your heart-sun to be the embodiment of forgiveness, and that your heart-sun is overflowing with love and bliss. Be sincere in feeling these emotions. (K) — KINDNESS: (2 minutes) Feel compassion, tolerance, and complete benevolence to all. Feel as if you want to embrace the whole world and all creatures therein. (8:10-8:25pm) Now stop feeling and radiating JVPLK, just be in the center of your heart in a state of bliss, of universal love for all. Stay there for 15 minutes. (8:25-8:30pm) Relax and just be passive, forget your visualization. Do this for 5 minutes. Recent psychological and medical sciences have proven scientifically that stress is a main cause of poor health, mental, and physical diseases. This heart-sun radiation completely removes stress and strengthens the immune system, and if done regularly for the rest of one's life creates a stress-free living leading to a robust and perfect health. Scientific laboratory studies done at the HeartMath Institute in the United States proves that the heart commands the brain. The thoughts and energies generated from the heart boost the intelligence and creativity of the neurons in the brain in a positive way. The individual practicing this on a daily basis will not only maximize his intelligence, but also improve his memory and creative abilities making him one of the smartest persons in the world. What this technique does is that it uses our mind to focus and brings us closer to the more harmonious, creative, and nourishing energy that creates and sustains us; not to the gross vibrations which cause suffering and disease. All the pains and suffering, the absence of abundance, the presence of bad turn of events, the recurrence of undesirable circumstances are brought about by one's uncontrolled thought processes that are negative. 2. recent psychological and medical sciences have proven scientifically that stress is a main cause of poor health mental and physical diseases. this heart sun radiation completely removed stress and strengthens the immune system, and if done regularly for the rest of ones life creates a stpress free living leading to a robust and perfect What this technique does is that it uses our mind to focus and bring us closer to the more harmonious, creative, and nourishing energy that creates and sustains us; not to the gross vibrations which cause suffering and disease. All the pains and sufferings, the absence of abundance, the presence of bad turn of events, the recurrence of undesirable circumstances are brought about by one’s uncontrolled thought processes that are negative. This technique enables one to put a stop to the negative stream of consciousness, to transfer and expand the positive thoughts and emotions to our environment. All it takes is 30 minutes a day, every 8:00pm to 8:30pm of settling down and emoting positive thoughts. You can reformat your subconscious program and transform all the negative circumstances and start creating all the positive desirable circumstances in your life. Scientific researches show that positive and cheerful states of mind stimulate the release by the glands of beneficial hormones and chemicals which boost the immune system and strengthen natural resistance to disease while negative emotions trigger the release of toxic chemicals associated with stress and infection. 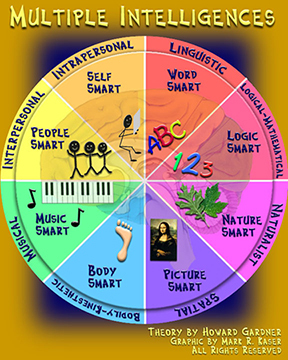 Practicing this technique also develops "Multiple Intelligences." An educational theorist and brain researcher who has had a huge impact on teaching practice is Howard Gardner of Harvard University’s Project Zero. Gardner postulates that there are many different kinds of intelligence, and that we all possess them in varying degrees. These “different ways to be smart” represent ways of looking at the world that can become doorways to understanding when teachers consciously include differentiated learning strategies in the classroom. According to a traditional definition, intelligence is a uniform cognitive capacity people are born with. This capacity can be easily measured by short-answer tests. In Gardner's view, learning is both a social and psychological process. When you understand the balance of your own multiple intelligences,you will begin to manage your own learning and value your individual strengths. You become balanced individuals who can function as members of your culture. This technique will develop the intelligences to foster deep understanding about the essential questions of life, such as: Where do we come from? What's the world made of? What have humans achieved? What can we achieve? How does one lead a good life? If you continue doing this technique for the rest of your life, your existence will not only be a success but you will live a life of auspiciousness. Everything you need will be provided for, bliss and peace profound will be your lot in life, the secrets of the universe will be yours, and God's blessings and grace will flow in your life abundantly. Synchronized practice at 8:00-8:30 p.m. (Manila time): When this technique is done simultaneously by many people (even if they are geographically distant from each other), the positive energy generated by their combined radiation is multiplied exponentially. Practicing this technique at the same time regularly and repeatedly also develops a habit which becomes implanted into the subconscious mind, producing abundant rewards in due time. CLICK THIS LINK for reference in synchronizing your time with 8PM Manila Time. The 8pm-8:30pm Heart Radiation - to invoke the Law of Radiation and Attraction, and to reprogram one's subconscious for positive change and let it open up to limitless possibilities of success consciousness, and to attract material abundance and prosperity. Pentagram Technique - to accumulate energy for health, vitality, material prosperity & personal magnetism. Heart Exercise - to develop a healthy and robust heart, to overcome stress and worries, to attain peace of mind and attune to the inner self, and to awaken genuine love and compassion. Pore Breathing - to regenerate and rejuvenate the different body parts, to stimulate energy flow and counter energy blocks causing disease and aging, and to awaken psychic sensitivity. Pineal Gland Practice - to develop willpower and the power of concentration, to stimulate creativity, and to awaken multiple intelligences. Forebrain Technique - to develop higher-order thinking, stimulate creativity, awaken insight, intuition, and inspiration, and atain good health and the attributes of genius. Creative Visualization - to get whatever you want in life by using your creative powers. Practice of Giving - to stimulate the flow of blessings towards you for attainment of prosperity and success. Power of Observation - to develop keen awareness of one's self and surroundings, and to allow deeper understanding of one's life and experiences. The Power of Gratitude - to improve health, bring happiness, protect one from danger, unnecessary accidents and diseases. This workshop module, loaded with self-improvement techniques, is a human resource empowering asset. Improved health and vitality will address problems on sickness and overall well-being. Improved focus and concentration will enhance productivity. Positive mental state will promote cooperation and harmony. And success attitude will instill personal initiative and perseverance.